The early twentieth century was a time of great development in the automotive industry. Across America and around the world, assembly lines were producing vehicles that were changing the lives of everyone from ordinary middle-class workers to the owners of businesses. One company that found relative prosperity during this time was the Indiana Truck Corporation, founded and based in Marion, Indiana. Indiana Truck began as a bedstead manufacturing venture, then after experimental truck production, began producing trucks. From 1910 to 1933, Indiana Trucks was a truck manufacturer in Marion for both business and personal purposes affecting customers all across the nation. Production was boosted by the need for military vehicles in World War I, and the company boomed in the 1920s along with the nation's economy and the growth of highways, before being acquired by Brockway in 1928 and ending production in Marion in 1933. Like many small automotive companies of the time, Indiana Trucks experienced a quick rise and fall in prosperity at the start of the twentieth century. The first Indiana Truck, No. 1001, which was sold to O. Gordon of Gas City, and later resold to Charles Stewart. What later became Indiana Truck Corp. started out in manufacturing bedsteads but quickly turned to trucks. It was started in 1898, when Marion manufacturers George C. Harwood and Charles G. Barley formed a partnership. At that point, the company was named the Marion Iron and Brass Bed Company (Buffington 10). In the first decade of the twentieth century, the automotive industry was beginning to boom, especially in the Midwest. Historian Mark Sullivan said in his book Our Times that during this time, "in nearly every village and town in America, especially in the Midwest, the local mechanical genius devoted his whole being to this new device (the automobile)"(97). In 1895, approximately 300 motor vehicles were in operation in the United States. Ten years later, the number was close to 78,000 (Sullivan 106). The company became involved with experimental truck production (Buffington). 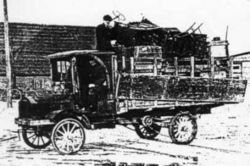 The first truck made entirely by the company was released in 1910, after several months were spent building the truck and testing it ("Marion Chronicle"). The truck was sold to O. Gordon, a furniture dealer in Gas City, Indiana. Gordon later sold his truck to Gas City resident Charles Stewart. The new owner praised his truck in a 1923 book of testimonials from Indiana Truck owners, published by the company. Stewart said: "Almost six years ago I bought my old Indiana Truck from O. Gordon, who had used it for a number of years. I am using this old truck every day, doing local and long distance hauling. This truck paid for itself the first three months of service. It is very cheap to run and I have absolutely no engine trouble. It starts easily in the morning and keeps running smoothly all day. I consider this old truck equal to any job. This old Indiana certainly is a good one, even though it is thirteen years old." ("Veteran" 4) At the time the book was published, the original truck had racked up 140,000 miles. The introduction to the book clarified that it is "equivalent to five trips around the world" ("Veteran" 3). In 1911, the company changed its name to the Harwood-Barley Manufacturing Company and devoted itself to the production of trucks along with the continuing manufacturing of bedsteads and bedsprings. In 1913, to convince potential customers and salesmen of the quality of the Indiana Trucks, the company published a list titled: "39 Reasons Why You Should Sell Indiana Trucks." At the time, automotive companies were still trying to prove that cars and trucks were wiser choices than horses and wagons, as displayed by reason number three on the list: "3. Because Indiana Motor Trucks are more dependable than horses and sure in the extreme heat of summer or in the snow and ice of winter" ("39 Reasons"). Reason number 17 said: "17. Because there have been only two advances made in the delivery of merchandise, namely, from the time of oxen, then to the horse, now to the Indiana Trucks, while other systems of manufacturing, sales, and what not have entirely changed" ("39 Reasons"). A booklet published by the company indicated another sign of the changing times, which listed the dangers, obvious to us today, of speeding in a motor vehicle: "On an even stretch of pavement the temptation is strong to 'get there.' TIME is a less important factor than SAFETY, to yourself, pedestrians, and the truck" ("Know"). By 1913 the company was doing business across the country, as more and more consumers were turning to trucks. Indiana Trucks increased production and expanded business from 1914 to 1926. One reason was the World War in the late 1910s. The involvement in the war brought about a necessity for vehicles to help. Fifteen truck manufacturers helped with the production of the class "B" Liberty trucks. One of these manufacturers was Harwood-Barley, as they produced 475 Liberty trucks during the period of 1917-1918 (Buffington 11). The "Veteran Indianas" catalog also told stories of other satisfied owners of Indiana Trucks. One owner said that his 13 year-old Indiana "runs like new . . . I moved a barn with it. The barn was 30x40 ft. old fashion frame. I moved it about 60 rods. I pulled it with this old truck" ("Veteran" 5). The Model "T" 1-ton Worm Drive. Indiana claimed that the "motor operates silently and economically under sever conditions." ‎In 1918, Indiana Trucks consisted of four different models advertised in it's catalog. One was the Model "T" 1-ton Worm Drive. The Indiana Truck catalog described it as "built rugged" ("Full Line 1918"). It had a "heavy channel steel frame that will carry the load over the roughest roads with sureness. Motor operates silently and economically under severe conditions. The quality of this Indiana Truck safeguards your investment" ("Full Line 1918"). The Model "D" 2-ton Worm Drive. It was deemed "America's Greatest Truck Value" by Indiana Truck. Another truck produced in 1918 was the Model "D" 2-ton Worm Drive, what the catalog called "America's Greatest Truck Value" ("Full Line 1918"). The company now had trucks for many different purposes, including the Model "L" 5-ton Worm Drive, a "Big Truck to Carry Big Loads" ("Full Line 1918"). In 1915, the Harwood-Barley Manufacturing Company changed its name to Indiana Truck Company, reflecting its main concentration of business. In 1917 it was reorganized as Indiana Truck Corporation. Indiana Truck Corporation grew to a national level, and in 1925 owned fourteen depots across the country, many in the South. They included outlets in Jacksonville, Tampa, Miami, West Palm Beach, Atlanta, Dallas, Chicago, St. Louis, Kansas City, Louisville, Pittsburgh, Long Island, Cambridge, and San Francisco. In 1925, the company claimed to be "one of the most successful manufacturers of high grade Motor Trucks in the country" (Foreword). 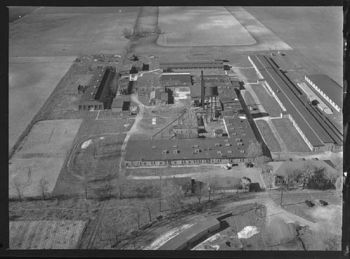 The company thrived through the end of the 1920s, but its time in Marion was limited after being acquired. It was the end of an era of independence for the Indiana Truck Corporation, as Brockway controlled it from 1928 to 1932. The company kept the name of Indiana Truck Corporation, however, and continued to operate out of the Marion factory (Buffington 11). 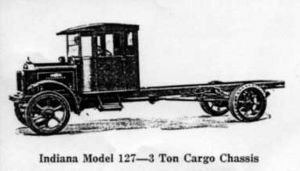 The 1927 line of Indiana Trucks contained sixteen different models. 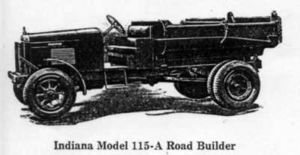 One of the larger trucks built was the Indiana Model 115-A Road Builder. The large truck could go 25 miles per hour ("Full line 1927"). The Model 111-X Road Builder. 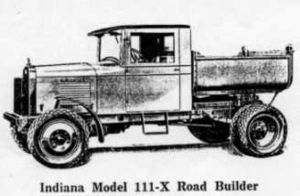 In 1928, the company's catalog listed fourteen different trucks, including three of the Road Builder models: the Indiana 111-X, 115-A, and 127-A. All three of these models, just like the three Road Builder models from 1927, included built-in dumping bodies on the back of the truck ("Full Line 1928"). The dumping body is the cargo hold in the back of a truck that can be tilted to dump out or load contents more easily. The catalog described one of these devices, saying "this model 111-X Road Builder chassis is also furnished with 41 cubic foot dump body and hydraulic underbody hoist . . . Body width 60" front, 64" rear, length 66", height 17 3/8". Top of body from ground when empty 57". 52° dumping angle" ("Full Line 1928"). Eventually, the company became a subsidiary of White in 1932, and the name of the company was changed to Indiana Motors Corporation. On December 12, 1932, White Corporation announced they would move production of Indiana Trucks from Marion to Cleveland, Ohio. White continued to make trucks bearing the Indiana name until 1939 (Buffington 11). During its years in Marion, the Indiana Truck company found relative prosperity and success in the trucking business, spreading it's business throughout the United States. Its success in the early part of the twentieth century in Marion was short-lived due to its transfer out of the area, as the White corporation only used it as a name to attract customers for several years. However, as shown by the variety and dependability of the different models, the Indiana Truck Corporation was a successful company that expanded to many areas of the trucking business during it's years in Marion, Indiana. 1898 George Harwood and Charles Barley form partnership of Marion Iron and Brass Bed company. 1910 Company creates first truck, the 1001, which is sold to O. Gordon of Gas City. 1911 Re-named to Harwood-Barley Manufacturing. 1917 Company begins production of class "B" Liberty trucks for World War I. 1920 Re-named to Indiana Truck Corporation. 1925 Currently has 14 depots nationwide. 1927 Acquired by Brockway, Co.
1932 Control of company transferred to White Corporation. 1933 Production of Indiana Trucks ends in Marion, moved to White's Cleveland home plant. This article was written by Taposh Rudra for Barbara Pack's AP English class and Bill Munn's AP History Class at Marion High School. This page was last modified on 11 May 2009, at 01:54.